The infotainment systems, dashboards, designs, and virtually every other component of a vehicle has been upgraded, but the steering wheel has always remained in stasis. However, German engineers are on their way to developing a smarter steering wheel. The Germans are great engineers – that’s a fact. Not much can be argued against their work. 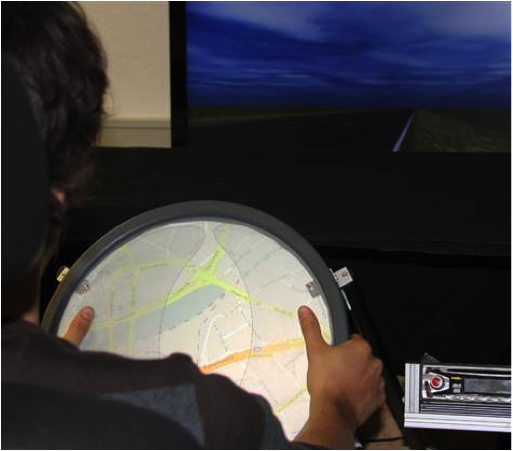 Recently, researchers at the University of Duisburg-Essen have been developing a prototype wheel to keep your eyes more focused on the road. Out of the norm, this steering wheel is something you would see in a futuristic sci-fi film. Think of a large dinner plate and add a virtual display overlay. Or put simply, just a circular tablet. Studies show humans are easily distracted while driving, partly due to looking at their infotainment screens, dashboards, and instrument cluster. The engineers developed the virtual display on the steering wheel so everything is right in front of us while we drive. Drivers would no longer have to look to the side, toward their screens, further reducing the chances of an accident. The steering wheel will always display a map of the road, so if you adjust your eyes to the wheel you’ll still see where you are going. Your thumbs will control many of the options in your car such as music, air conditioning, and navigation. Your hands will always be on the wheel. It is true this is just a prototype, but I’m glad researchers are increasing their interest in upgrading the steering wheel – something that has not changed much since cars were first manufactured. There are increasing discussions on autonomous vehicles and drivers becoming “extinct” in a few years, but it’s very unlikely that humans will no longer be driving. Driving is a sport to many. Imagine driving your whole life and then suddenly a law is instituted preventing humans from driving anymore – there would be a rebellion! The point I’m trying to make, is that no matter how much closer we get to self-driving cars, engineers and researchers will still develop automotive technology designed for human interaction.